A STRIKE involving members of the Association of Mineworkers & Construction Union (AMCU) at the premises of Sibanye-Stillwater’s gold mining operations since November 21 was no closer to resolution, said BusinessLive. Sibanye-Stillwater sought to extend the wage offer that had been accepted earlier by the National Union of Mineworkers (NUM) and Solidarity unions to AMCU. 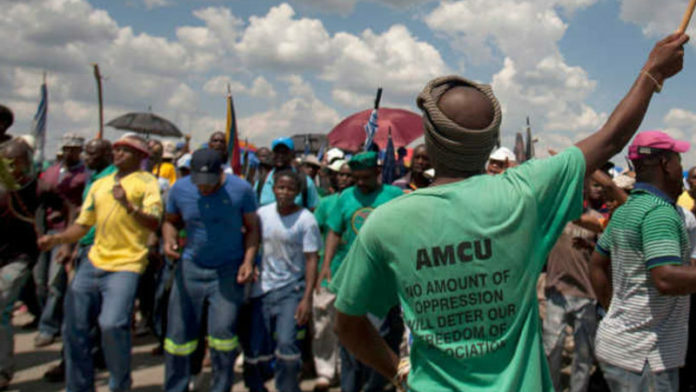 Sibanye-Stillwater argued that these unions represented the majority of people employed at the mine and AMCU’s strike was therefore illegal in terms of labour law. However, the Labour Court was not in agreement with this interpretation unless the company verify its union numbers – a process that is currently underway. In the meantime, the Labour Court ordered AMCU and Sibanye-Stillwater to settle their differences at the Commission for Conciliation, Mediation and Arbitration (CCMA), But those talks have been far from smooth. “With the first day back at work being January 3 2019, employees at the gold operations have started to report for work,” James Wellsted, head of investor relations at Sibanye-Stillwater told BusinessLive earlier this week. The strike by almost 15,000 AMCU workers had “… affected the gold operations to varying extents”, said Wellsted. He said an update would be released “in due course”. Close these mines and invest outside of South Africa. This is and has been a lost cause for many years now and it will never recover. There is such a huge unemployment figure in South Africa. Get people who actually WANT to work and fire these useless ones. Nobody FORCED them to take up the job from the start. If they are not happy then go work somewhere else. It is time they realize that it is their GOVERNEMENT ruining everything by stealing money and running that CIRCUS, it is NOT the mines. It is also time people realize that you actually have to WORK for your money. Yes that’s right, that means putting in effort and doing your best in your job and getting paid accordingly. Years ago there were not even a third the number of staff they have on shafts than they have now and the production was more than double (especially in the Platinum sector). That just shows you how useless they have become. Just want money but NEVER want to actually work for it.